Directions: The recommended dose is one tablet 30 to 60 minutes before bedtime. If necessary, on subsequent evenings, swallow 1 additional tablet earlier during the evening. Read the package leaflet before use. Not recommended for anyone under 18 years old.<br>Do not take if you are allergic to any of the ingredients.<br>Do not take if you are taking any other medicine for sleep.<br>Kalms Night One-A-Night is not recommended for use during pregnancy or when breast-feeding. Ask your doctor or pharmacist for advice before taking any medicine.<br>You must contact a doctor if symptoms worsen or do not improve after 4 weeks. 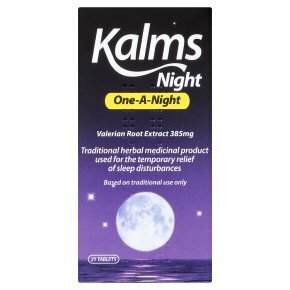 Kalms Night One-A-Night is used traditionally to help you sleep. If you feel sleepy, do not drive or operate machines.<br>Alcohol may increase the sedative effect. Excessive alcohol consumption should be avoided.<br><br>Keep out of the reach and sight of children.